Background: The usage of natural fibres as reinforcement in bioplastic polymer composite has garnered attention during the last few decades. This is due to limitations of biodegradable polymerbased materials which have an intractable nature, poor water-sensitivity, poor mechanical strength and are brittle. Natural fibres are preferred as they can be obtained naturally, be safely collected and can save costs compared to glass fibres. Moreover, natural fibres can be used to make various products including filters, brushes, mats, cushions, rope and shelter for fish breeding. However, many waste products are generated from fibres and fruits. Therefore, to reduce waste produced, many experiments have been conducted with the aim of maximizing the product while minimizing waste. Many studies focus on bionanocomposites, which are used with natural fibres due to their abundance and potential for replacing carbon fibre and fibresglass in the future. Nanocrystalline cellulose (NCCs) serves as a promising candidate for bionanocomposite due to its nano-scale cellulose fibre composition, high strength and stiffness, low weight and biodegrability, renewability and its production and application in the development of composite materials. Therefore, the aim of this paper is to review research related to NCCs and its various applications in polymer reinforcement. Methods: Research articles related to the use of nanocrystalline cellulose as reinforcement for polymeric matrix nanocomposites and its potential applications were reviewed. A summary of nanocrystalline cellulose reinforcement for various polymer matrices was provided. This article was separated into sections involving characterization, extraction and processing of NCCs from various plants, formation of cellulose nanocomposite and new application developments. 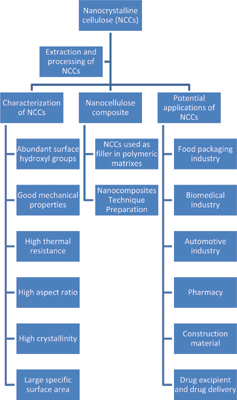 Results: Studies highlighted in the article detailed suitable characteristics of NCCs for various nanocomposite applications such as for packaging, use as a drug excipient and in drug delivery, in automotive, optical, substitute/biomedical, pharmaceutical and construction industries. Conclusion: NCCs have gained substantial interest due to its unique features, such as cost effectiveness, high aspect ratio, and its light weight. In summary, this article reviewed several current research in NCCs from the preparation of nano-scale green particle material. Furthermore, this article reviewed mechanical nanocomposite properties, and the range of application potential of this green material. Cellulose, nanocrystalline cellulose (NCCs), nanocomposite, green material, natural fibres, bionanocomposites.